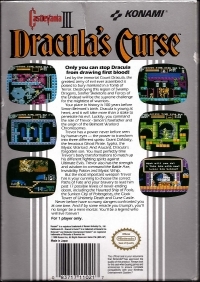 Box Text: Only you can stop Dracula from drawing first blood! Led by the immortal Count Dracula, the greatest army of evil ever assembled is poised to bury mankind in a Tomb of Terror. Destroying this legion of Swamp Dragons, Slasher Skeletons and Forces of Undead will be the supreme challenge for the mightiest of warriors. Your place in history is 100 years before Simon Belmont's birth. Dracula is young at heart and it will take more than a stake to penetrate his evil. Luckily, you command the role of Trevor - Simon's forefather and the origin of the Belmont Warlord Chomosomes. Trevor has a power never before seen by human eyes - the power to transform into three different spirits: Grant DaNasty, the ferocious Ghost Pirate. Sypha, the Mystic Warlord. And Alucard, Dracula's forgotten son. You must perfectly time Trevor's body transfomations to match up his different fighting spirits against Ultimate Evils. Trevor also has the strength and wisdom to command the Battle Axe, Invisibility Potion and Mystic Whip. But the most important weapon Trevor has is your cunning to shoose the correct Paths of Fate and your bravery to lead him past 17 possible levels of never-ending doom, including the Hunted Ship of Fools, the Sunken City og Poltergeists, the Clock Tower of Untimely Death and Curse Castle. Never before have so many dangers confronted you at one time. And if by some miracle you triumph, you'll no longer be a mere mortal. You'll be a legend who will live forever! 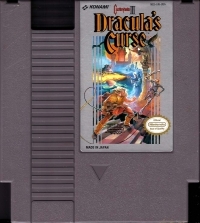 This is a list of VGCollect users who have Castlevania III: Dracula's Curse in their Collection. This is a list of VGCollect users who have Castlevania III: Dracula's Curse in their Sell List. 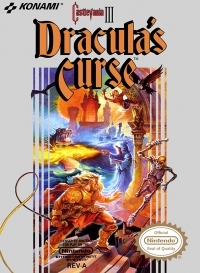 This is a list of VGCollect users who have Castlevania III: Dracula's Curse in their Wish List.